Posts on our bed and breakfast accommodation blog about The Stadium of Light, Sunderland, SR5 1SU. 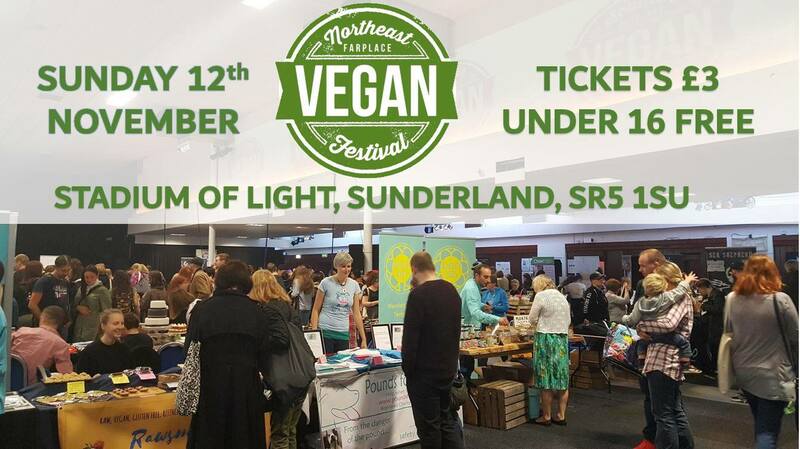 The North East Vegan Festival is back at Sunderland‘s Stadium of Light on Sunday 12th November 2017. Tickets to the festival cost £3 for a standard entry ticket or £15 for an VIP ticket which includes festival entry, a goodie bag and early entry to the festival at 10am. If you are looking for bed and breakfast accommodation for your visit to Sunderland‘s Stadium of Light which is approximately 15 minutes from us by bus/car you can book online here: online booking. If you are staying with us and planning a visit to Sunderland or Durham by public transport then the 20 Prince Bishops 20 20A X20 bus service that links Durham, Sunderland and South Shields. The #20 Sunderland to/from South Shields bus service is the quickest way to get to/from Sunderland City Centre (Park Lane Interchange), the University of Sunderland (City Scape campus and St Peter’s aka Tom Cowie campus) and the Stadium of Light. Journey time from South Shields to St Peter’s aka Tom Cowie campus and the Stadium of Light is approximately 15 minutes. Journey time from South Shields to Sunderland City Centre (Park Lane Interchange) and the University of Sunderland City Scape campus is approximately 20 minutes. When you have disembarked the bus at Fowler Street it is a few minutes straight walk along Beach Road to our guest house accommodation. 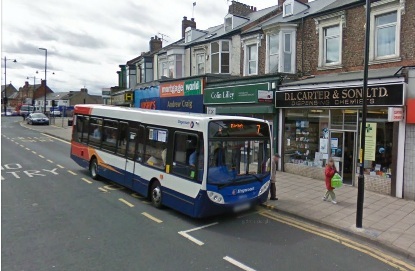 ‘A’ on the image is the Fowler Street bus stop and ‘B’ on the image is the location of our South Shields guest house. The image below is centred on South Shields town hall on Westoe Road in South Shields, identifiable by it’s clock tower. The road above it on the image is Beach Road (shown with a long red line). Turning the corner from Beach Road, walking in front of South Shields town hall, is Westoe Road. The shorter red line at the bottom of the image is the location of the Sunderland-bound #20 service bus stop on Westoe Road. 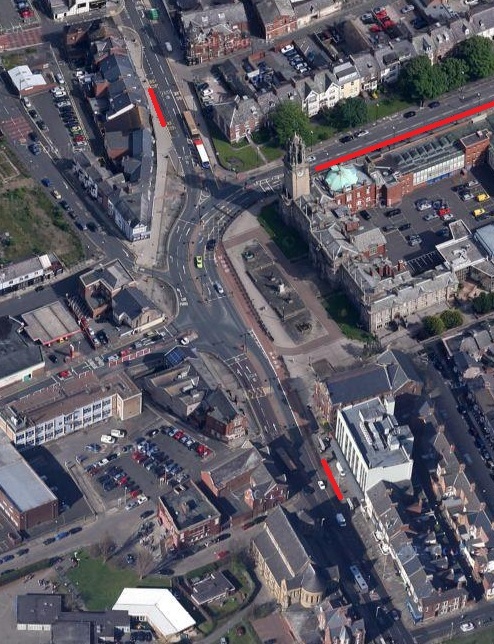 The shorter red line at the top of the image shows the location of the Fowler Street bus stop, shown previously, where you should disembark the #20 bus service on a Sunderland to South Shields journey. For South Shields to Sunderland journeys including the Stadium of Light, Sunderland Aquatic Centre, University of Sunderland, Sunderland Royal Hospital, City of Sunderland College’s Bede Campus and Sunderland Park Lane Interchange you should catch the bus on Westoe Road opposite the Britannia Inn. 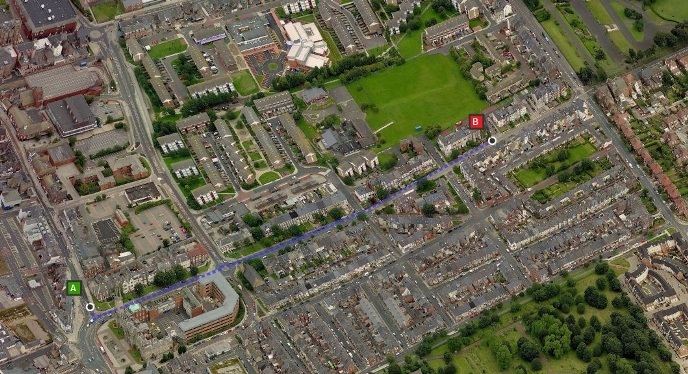 The short red line at the bottom of the image indicates the location of the Sunderland bus stop. Barbadian pop music superstar Rihanna is to play a gig at Sunderland‘s Stadium of Light on Saturday 18th June 2016 as part of her 2016 Anti World Tour. Rihanna today announced her seven month tour dates including six UK venues – Coventry, Cardiff, London, Glasgow, Sunderland and Manchester. Tickets go on sale from Thursday 3rd December 2015 here. 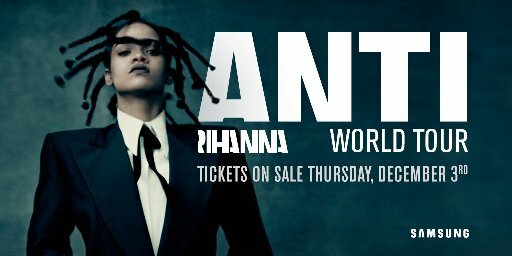 More information about Rihanna’s Anti World tour can be found on her website. Rihanna has previously played at Sunderland‘s Stadium of Light back in June 2013. Sunderland‘s Stadium of Light have also hosted other huge acts including the Foo Fighters, One Direction, Bruce Springsteen, Red Hot Chili Peppers, Oasis, Kings of Leon, Coldplay, Take That and Pink. If you have bought tickets for Rihanna at Sunderland‘s Stadium of Light on Saturday 18th June 2016 and are looking for bed and breakfast accommodation in the area we are located 15 minutes by bus from Sunderland‘s Stadium of Light. At the time of writing we still have rooms available but demand is always high for Stadium of Light events so we advise you to book as soon as possible to avoid disappointment. 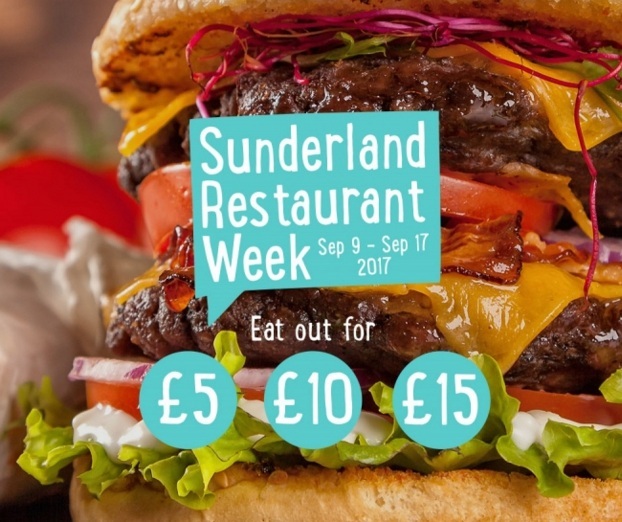 For more Sunderland related posts on our blog click here Sunderland. If you are staying with us and planning a visit to Sunderland or Durham by public transport then the 20 Prince Bishops 20 20A X20 bus service is the new bus service replacing the 35 Laser bus service. From 25th January 2015 the #20 Sunderland to/from South Shields bus service is the quickest way to get to/from Sunderland City Centre (Park Lane Interchange), the University of Sunderland (City Scape campus and St Peter’s aka Tom Cowie campus) and the Stadium of Light.